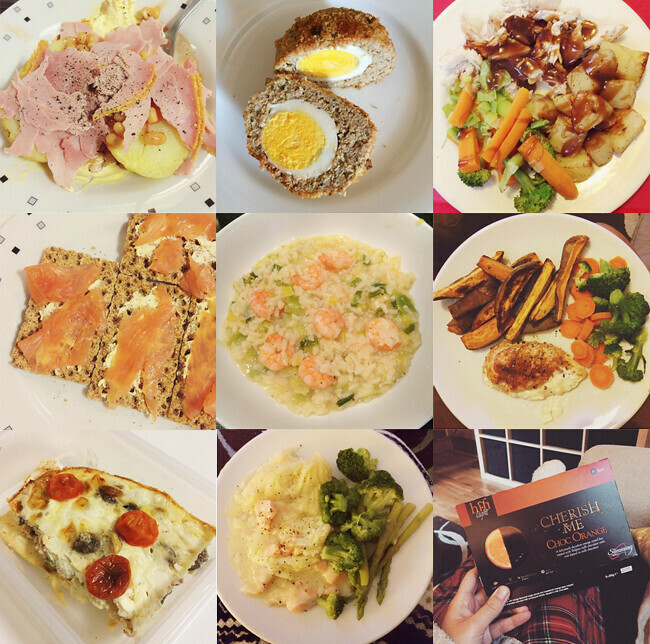 Week 4 on Slimming World has been longer, but not as beneficial as I had of hoped with only losing 0.5lbs! Although this takes my total to 8lbs in 4 weeks, I'm a little disappointed. I'd noticed i wasn't eating a my daily dose of Heathy Extra B, apart from at the weekends, so i made more of an effort to include it in my week. I managed 5 days and i felt horrendous, i felt SO bloated and sluggish. I asked some other member's and they said the same happens to them too and that i should try and find my B somewhere else. In all honestly, in the weeks i wasn't having much B I lost more and felt generally better. I've decided to cut it out and see how i get on. I know i'm getting enough fibre from the fruit i eat so i don't feel like i'm missing out on anything by not having bread, cereal, ryvita etc. On to what I've been eating this week. Breakfasts have been my usual fruit and yogurt and weekends bacon and egg on toast, or a cob. I'm a creature of habit I really am. Lunch has been jacket potato with beans, Ryvita and salmon and my bacon & mushroom quiche which i have now perfected and i love it, I'll try and get a recipe up soon! Pretty standard dinners this week, a roast, prawn risotto and fish pie to name a few. I did manage to make the Picnic Scotch Eggs which i'm SO pleased with how they turned out, i'm honestly so proud of these! They were so delicious too. I'll certainly be making these again in the future! I've got a bit of a social weekend happening from tonight, i'm off out to an Indian restaurant with James and my parents, I've done some research and it can be relatively low syn so i'm hopeful i can keep it in control but tomorrow we're off to Skegvagas for my sister in laws (not legally, yet!) birthday so i'm not sure how good i can be for that! We shall see. Favourite meal last week? I wouldn't call it a meal, but I LOVED my scotch eggs! Learnt anything new? HexB just isn't for me. Complete last weeks aims? I did stay on plan 100% but my HexB has ruined me! Any new dishes to try? I'd like to have something Chinese this week, a stir fry maybe? I'm used to those packet sauces which i know are pretty bad for you so i'll have to see what i can find. Wanting to lose? Really want to keep up averaging 2lbs a week so 2 but with my social weekend i'm not so sure! Ah 8lbs is still really good. Enough to make a difference when you pop on your clothes. I'm trying my hardest to get back on it after a weeks holiday. Seem to have lose albs but put albs on haha so still got a long way to go! Well done on the .5Lbs! It may not have been what you were hoping for but it's still a weight loss! I've lost 35Ls so far but have been feeling a bit demotivated this Week! This have given me some recipe inspo too! :) X.
I have just joined SW this week and I am LOVING it. It's stopping me from binging on bread AND i've not had any crisps or cakes or biscuits all week and i can eat chocolate and feel fine about it. HUZZAHH! Anyway I am thanking you for this because I remember you doing SW a while ago but at the tie I didn't need to lose weight, now I'e seen you start again and this time I *do* need to lose weight I bit the bullet and parted with my £60 to join online and although I'm only on day 5, I am really happily surprised. My first weigh in is SUPPOSED to be sunday.. technicaly monday since I didn't start the plan till monday? I dunno, anyway I'm going to be weighing myself tomorrow morning instead because Ii have to go for a meal out for my mums birthday (DAMN IT!) and I'm looking at the menu and I'm reckoning I'll be going over my syns, even with a kids meal lol, and I wouldn't want that to jepodise my FIRST weigh in. Here's hoping I've lost a pound or two to show me it's working! These food look so delicious. thank you for sharing. This is delish and Chinese-y! Not sure what it'd be like syn-wise but I can have it on Weight Watchers as it's not too many points.